An unblinking look into the way humanity confuses lust and love, goodness and self-righteousness, Measure for Measure explores who sins most in a congregation of murderers, pimps, politicians, whores, nuns, and nobles. 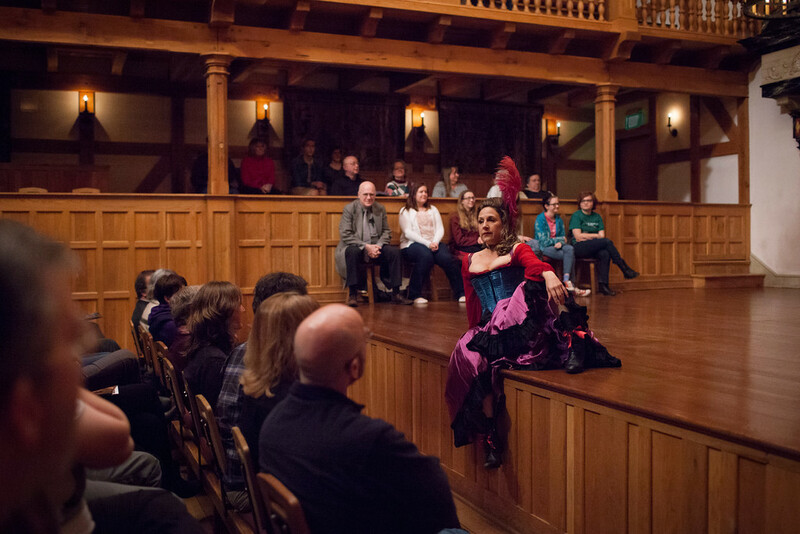 Shakespeare’s electrifying exploration of the arrogance of power hovers tantalizingly between comedy and tragedy. 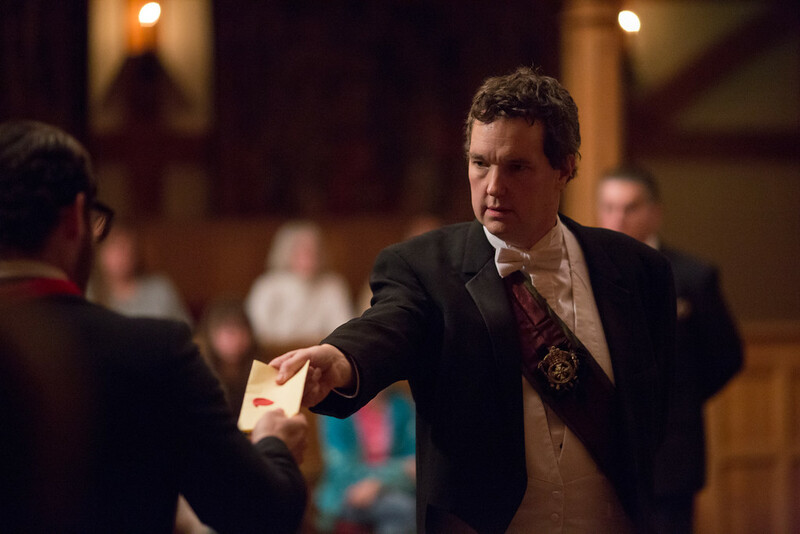 John Harrell in MEASURE FOR MEASURE. Photo by LINDSEY WALTERS. 2016. Ginna Hoben in MEASURE FOR MEASURE. Photo by LINDSEY WALTERS. 2016. 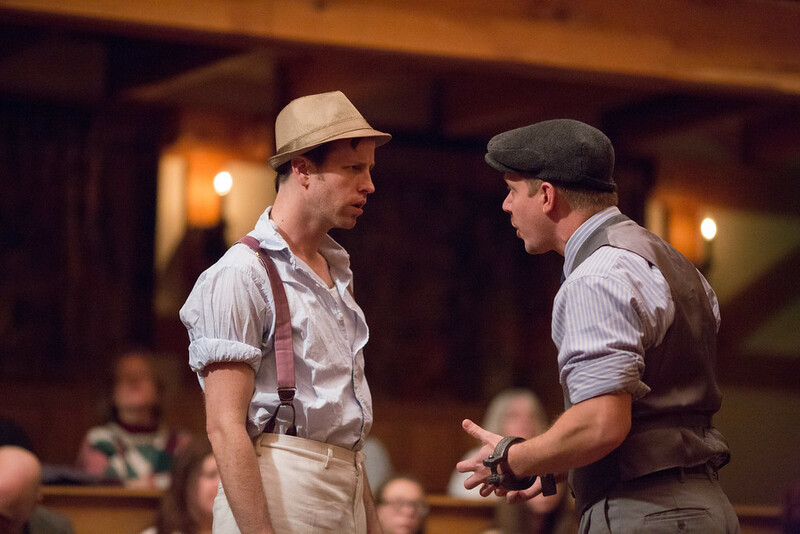 Chris Johnston and Benjamin Reed in MEASURE FOR MEASURE. Photo by LINDSEY WALTERS. 2016. 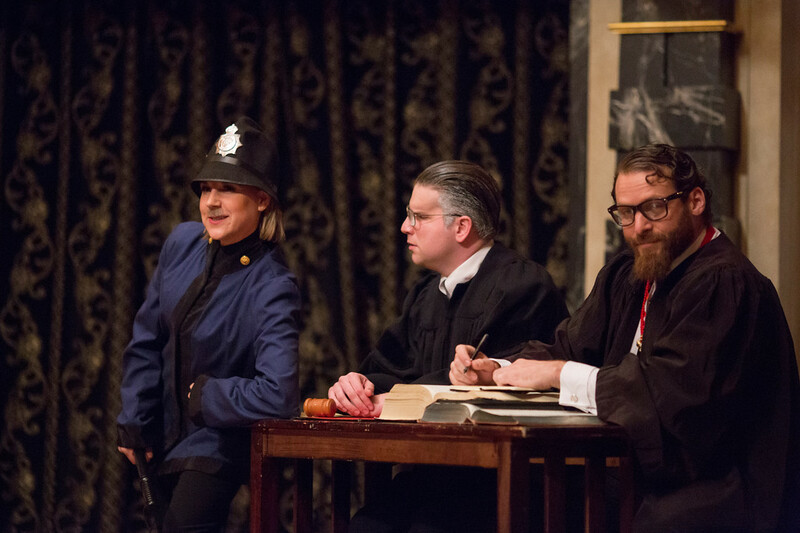 Ginna Hoben, Aidan O'Reilly, and Jonathan Holtzman in MEASURE FOR MEASURE. Photo by LINDSEY WALTERS. 2016. 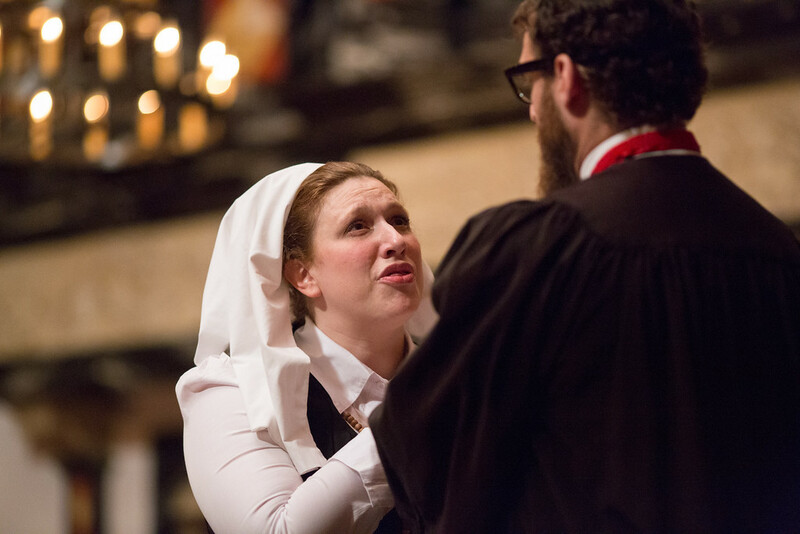 Allison Glenzer and Jonathan Holtzman in MEASURE FOR MEASURE. Photo by LINDSEY WALTERS. 2016. John Harrell and Lauren Ballard in MEASURE FOR MEASURE. Photo by LINDSEY WALTERS. 2016. Allison Glenzer and Benjamin Reed in MEASURE FOR MEASURE. Photo by LINDSEY WALTERS. 2016. 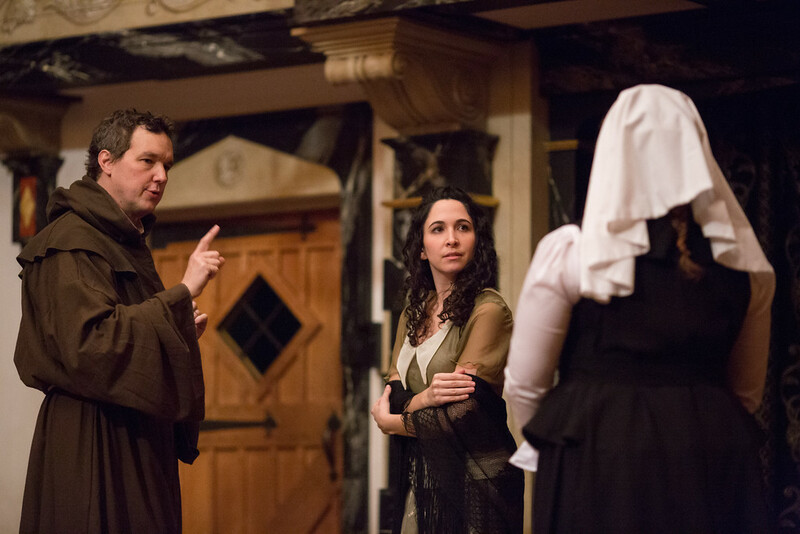 John Harrell, Lexie Braverman, and Allison Glenzer in MEASURE FOR MEASURE. Photo by LINDSEY WALTERS. 2016. 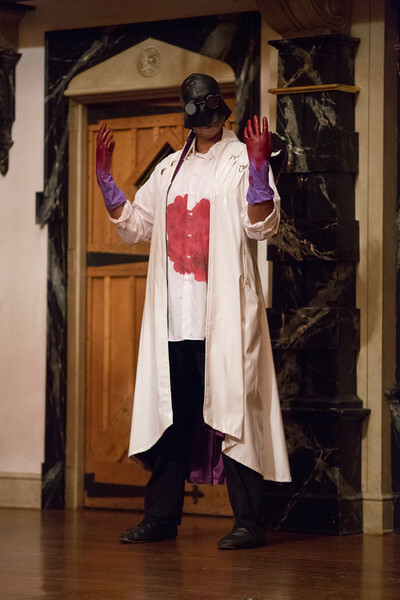 René Thornton, Jr. in MEASURE FOR MEASURE. Photo by LINDSEY WALTERS. 2016. 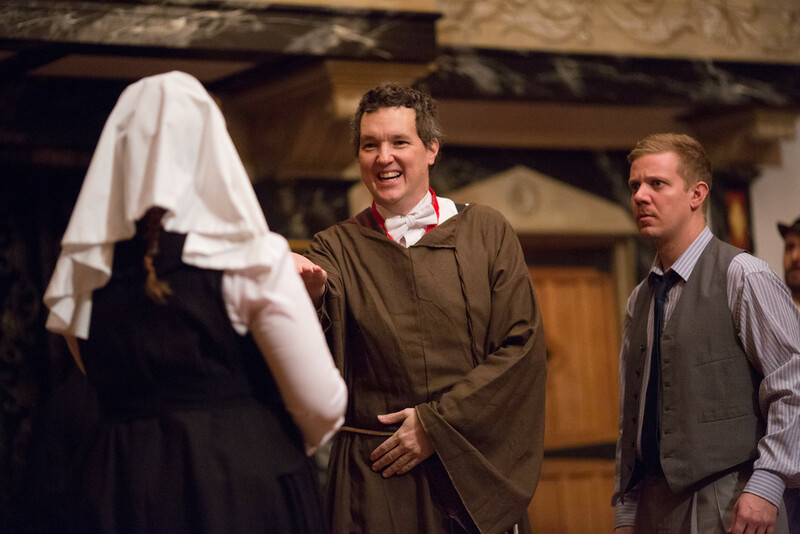 Allison Glenzer, John Harrell, and Benjamin Reed in MEASURE FOR MEASURE. Photo by LINDSEY WALTERS. 2016. Angelo swiftly restores old laws against sexual depravity, closes the city’s brothels, and arrests fornicators. Claudio is immediately arrested and sentenced to death for apparent premarital acts with his pregnant fiancée, Juliet. Claudio entreats his friend, Lucio, to find Isabella, Claudio’s sister, and ask her to plead to Angelo for Claudio’s life. Angelo, at first, refuses Isabella’s suit, but then agrees to stay Claudio’s execution — only if Isabella will consent to certain demands. The Duke, still disguised as a friar, decides to intervene. Plots to rescue Isabella’s integrity, save Claudio’s head, and expose treachery ensue. 3. How does this play fit into Shakespeare’s career? Shakespeare writes Measure for Measure after Hamlet, during a period when his plays look intensely and somewhat darkly at sexuality. Measure for Measure is one of three plays (with All’s Well and Troilus and Cressida) that critics classify as “problem” plays. They do so because they find the subject matter in these plays and their outcomes inappropriate to comedy, a reaction that might merely mean the problem is that critics don’t see enough movies by the Coen brothers. In its look at power politics, sexual hypocrisy, and the surveillance state Measure for Measure feels more contemporary than any of the other plays. It’s as if Vladimir Putin, Heidi Fleiss, and Edward Snowden had collaborated on a script for an episode of Orange Is the New Black. They admire it and find it a particularly interesting look at London’s underbelly (though the setting is ostensibly Vienna). Editors debate how much of the play might have been written by Middleton, and literary and performance critics debate how to read Isabella’s silence at the end of the play. 7. Does any controversy surround the work? The play has always been controversial for its sexual content. A Spanish monk who was striking through bawdy lines in Shakespeare’s other plays, faced with all the sexual material in Measure for Measure, simply cut the entire play out of his copy of the Folio. In terms of its stage history, for centuries the play was either adapted into a PG script or ignored altogether. Barnadine, the condemned murderer. He only appears once in Act Four, but his illustration of the existential “no” is something that Jean Paul Sartre would be proud to have written. Certainly the most immediately disturbing scene is the one in which Angelo asks Isabella for her “love” in exchange for her brother’s life. This kind of “measure for measure” plays its way through the work to emerge – also disturbingly – in the play’s ending. Dense, rich in euphemism and full of entertaining colloquialism, translated for your theatrical pleasure – as it was for its first audiences – by the talent of actors.